There’s also an opening reception for Michelle LeBlanc’s solo show in the front room next Saturday afternoon, March 7, from 2 to 4 p.m., which I plan to attend. I’ve joined the artists’ collective, so I’ll have work hanging there every month. On Sunday morning I got to sleep in. I awoke to a loud argument between my husband and my son, on either side of the bathroom door. I think I’m a little bit in love with South African photographer Mikhael Subotzky. I first discovered his work a few months ago, via JM Colberg. I was immediately drawn in by how he taught photography to the prisoners he photographed and got their work exhibited as well as his own. And of course, anyone who knows me knows I have a thing for South Africa and its people (my husband is South African too and almost all his family is still there). Subotzky reminds me of my husband’s cousins, who are smart and articulate and so much more engaged in the world around them than the young people I meet here in Canada. For all the country’s problems (and yes there are many and they are big), I think there’s something amazing going on there, culturally. “JC: I don’t know whether one would have the same impression living in South Africa, but looking from the outside – and from far away – it seems like South Africa had such a bright moment of hope when apartheid was dismantled and when Nelson Mandela was elected President, and so much has gone wrong since then, for whatever reason. Do you see it as your responsibility (if that’s a word you’d be comfortable with) to record what’s going on? To preserve this moment in time, maybe to foster some awareness and change? My husband’s granny, my son’s only living great-grandparent, is in a hospital in Cape Town, and the prognosis isn’t good. I’ve had the good fortune to meet her twice, both times with the awareness that it could be the last time, and yet her voice is so strong and her eyes so clear, that part of me didn’t really believe it. I wish we could be there, especially since her recent hearing loss has made a phone conversation with her virtually impossible. The other night, I discovered Katharina Bosse’s “Portrait of the Artist as a Young Mother” series (also through JM Colberg). I find her work really interesting, and as I’ve already written here, I’m particularly interested in explorations of motherhood. Apparently, a professor of photojournalism dismissed her work in a German publication as “irrelevant and a calculated provocation” (Colberg’s translation — I can’t speak or read German so I trust his representation). I find that statement pretty telling: motherhood is irrelevant – and yet highly prescribed – in the western world, and any attempt at making that experience central or subverting those presciptions is a calculated provocation. Now here’s where I came to a dilemna. I discovered that another body of Bosse’s work is very similar to a project I’ve just begun (which I’m not ready to blog about yet). I only glanced at a few photos of that other series before I decided not to look any more. If I end up doing the same kind of project, at least I could say I hadn’t seen her work or been influenced by it. But I’ve always felt strongly that influence is good. I remember when I wrote poems in university, getting royally irritated on more than one occasion when people declared themselves poets (there goes that noun thing again), and in the same breath announced that they never read anyone else’s poetry, lest they be influenced. I still think that’s crap. The only way to be good at something is to be influenced by practitioners who are better than you. So I think I just have to see this as the opportunity it is and dive in. Laugh if you must. But last night I went to the So You Think You Can Dance Canada show in Hamilton (or, as Nico, Danny and Vincent called it: ahMILton) and I loved it. Just in case you didn’t know, last spring Canada held auditions for its own version of So You Think You Can Dance. It aired in the fall, and I have to say that the top 20, IMHO, was stronger than any top 20 the American version featured. We also got to sample Canada’s fantastic choreographers, who were at least as good as the Americans, and we got a few visits from US favourites like Mia Michaels and Dan Karaty, the screamer judge, Mary Murphy (note: when she’s screaming that some of the best dancers on the planet are in your country, her screams aren’t nearly so earsplitting). Anyways, so last night I took my friend, just returned from Malawi, to the live show. Our seats rocked, and immediately I regretted not having my camera. Seriously, we were 12 rows back from the stage. We were so close, I could see that Nico was flying low during the creepy cane piece that he, Allie, Natalie and Miles did. I didn’t have particularly high expectations, since I’d watched the whole show on tv. I didn’t really think the live version would offer much that the tv version didn’t. But it did. The live dances had so much more subtlety than on tv. Partly I hold the camera operators and editors responsible because the tv view moves so erratically around the stage that you often can’t pay attention to what you want to. But also, there’s something about living, breathing people that just give so much more nuance. The bottom line? I love Lisa and Vincent more than ever. I still think Arassay got short shrift, I can’t help but suspect that Nico’s getting a big head (the screams for him seriously impaired my hearing), Miles is as adorable as ever, Isaak (or Izak or however he spells it) still annoys me, and the producers should really hire an MC for the live show instead of making the dancers spit out overly rehearsed and silly intros. I find it really interesting the emphasis our culture puts on being nouns. Isn’t it interesting that BEING a dancer is not the same as being someone who dances? That the noun adds some kind of credibility or importance that the simple verb doesn’t? I mean, anyone can dance, anyone can love dance, but not just anyone can BE a dancer. It’s the same with writing. Anyone can write, but not anyone can BE a writer. It doesn’t make grammatical sense, but it says a lot about our culture, don’t you think? A few photography blogs have been linking to an article that I haven’t actually clicked through and read (and now I can’t find the references to link to it myself), but the gist was that with the economy tanking and the publishing industry changing so dramatically (some might say failing? ), eventually all photographers will only be amateurs. They’ll all have separate day jobs to support their true passion, and they need to get over their snobbery about that. Of course this is music to my amateur ears. A number of people have asked me if I want to be a professional photographer, or they’ve commented that I could be a professional photographer. But the truth is I don’t have much interest in that. Don’t get me wrong, I’d love a patron, someone who would just pay for me to live and make whatever pictures I want to make. But I really have no interest in making pictures for paying clients with demands and expectations. Even if that means my work is taken less seriously, for now, I’m ok with that. But still, I’m awfully glad to hear about people questioning the notions that only professionals can make great photographs. Yesterday was Valentine’s Day, in case you didn’t already know. 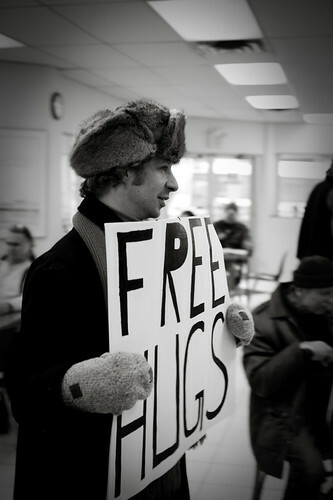 While I was at the Drop In Centre, two people came in with big signs offering free hugs. I thought this was pretty cool, so I pulled out my camera and started shooting. I’ve never just pulled out my camera there before, not like that, but I couldn’t miss the opportunity. As it turns out, the huggers also volunteer at the centre, during the week. The woman who led the free hugs (sadly I didn’t get any good shots of her) ended up helping us serve the meal, because somehow we seemed short-handed. Anyways, she told me that she first saw the free hugs idea on youtube, and she was just really touched by it, so she wanted to do it herself, and on V-day. She said a few people said it was exactly what they needed. It started as a call inward, a tightening, pulling my attention away from the restaurant and the conversation and my quesadilla. Eventually I discerned a rhythm to the calls, and they began to apprach pain. At home, I remember gripping the leather back of our rust-coloured chairs and shimmying away the pain. When the midwives came, I remember looking at the crack that ran across the plaster ceiling of our old spare room, and thinking we might not get a baby at the end of this. In the hospital, I had to labour on my left side, because the monitor on my belly said your heartrate plummeted every time I sat or stood upright. I remember holding the bars of the bed, and feeling I might lose my mind with the pain, that surely that meant I was in transition. But I wasn’t; nowhere near it. It was a relief when the doctor said it was time for a section (although I bristled at his short-form, which sounded more like vivisection than was really appropriate, in my opinion). On the table, I felt like Jesus with my arms strapped down, perpendicular to my body, and I was grateful for the anaestesiologist whispering in my ear, sweet nothings like “don’t worry, that feeling is normal, you won’t actually stop breathing,” and “you’ll feel some pressure now” and finally, “It’s a boy!” A whisper of an exclamation mark then silence. Long silence. 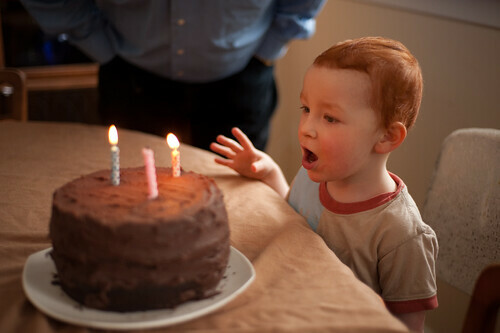 The midwife told me you had red hair, as excited as if she’d just given birth herself. Finally you squawked, from the other side of the room, and someone brought you, swaddled, to my side so I could look for a moment. “Hi baby,” I said, your pointy, old-man’s face getting smeared by my tears. “Why don’t you kiss him?” the midwife suggested. So that’s it. More photo posts soon, I hope. I got a nice package in the mail tonight: my new business cards, which I ordered from Moo. They look great. Some of the pictures lost their blacks, probably because of the very matte paper. But most of the images look really good, and the backsides are fantastic. What I like about these cards is that you can import many pictures from flickr, so you have a big selection of images on the front. Designing the layout of text and logos on the back of the card is intuitive and pretty easy, although I was really glad I had my husband on hand to tweak my logo to suit the card. And the price is way more cost-effective for my quantity needs than having cards (with only one image) printed at a local print shop. So if you have any need for business cards, check out Moo. Imagekind is about to start a Valentine’s Day promotion. From February 10 to 16 you can get 25 percent off their custom framing.